Vintage postcards can be odd. Why on earth would a visitor send the folks back home this picture of the 1927 Capitol Drive bridge? Before answering that question, there’s a funny thing about this bridge. In a roundabout way, it saved part of the Milwaukee River from being filled in for a riverside roadway. 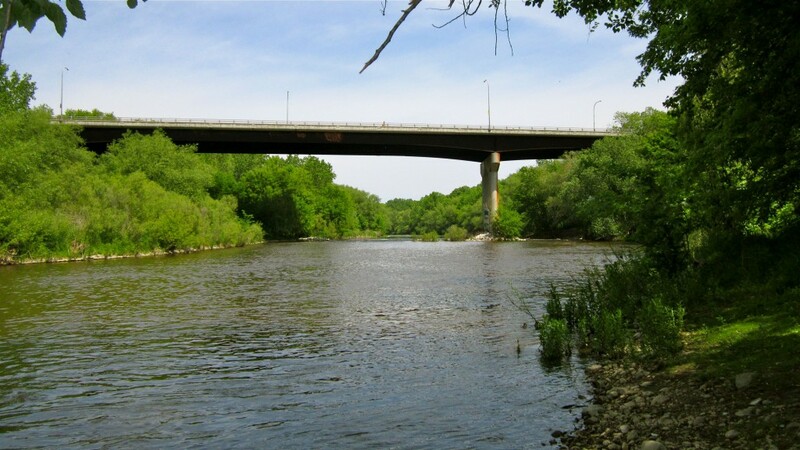 In summer 1931, four years after this bridge opened, Shorewood started dumping rubble into the river along on the east bank, south of Capitol Drive, with the intention of narrowing the river by 35 feet and building a roadway along the river. The planned first section extended north from the foot of East Menlo Boulevard, (basically today’s Hubbard Park), under the Capitol Drive bridge, to a junction 300 feet north of the bridge with the Milwaukee County parkway through Estabrook Park. Shorewood Village Manager Harry Schmitt told the Milwaukee Journal he hoped the city of Milwaukee would soon follow suit and build a river drive of its own connecting the Shorewood portion of the road southward along the water’s edge to Riverside Park and a connection with East Newberry Boulevard. In 4 to 5 years, he confidently predicted, motorists would be able to cruise along the Milwaukee River for several miles. The road, Schmitt added, was the only way to give the public the benefit of the use of the riverbank. Schmitt believed filling in a big chunk of the river for his new road to be completely reasonable and no opposition could arise. He was so totally wrong about that. Just four days later, Schmitt received a phone call from the state Public Service Commission ordering the village to cease dumping fill in the river. The action followed a joint protest filed with the PSC by Milwaukee city and county officials. They pointed out Shorewood’s village limits extend only to the natural east bank of the Milwaukee River and not to the center of the stream, as might normally be expected where two communities meet at a river. In other words, since the entire width of the riverbed is inside Milwaukee’s city limits, Shorewood was dumping fill outside of its jurisdiction. Ironically, it was Shorewood’s own action in an earlier dispute that doomed its plans for a river roadway. When the 1927 Capitol Drive bridge was planned (it replaced a spindly steel truss contraption so narrow there was scarcely room for two vehicles to pass), the city of Milwaukee asked Shorewood to share the cost. The village categorically refused, pointing to its charter, which set the community’s boundary at the water’s edge and included no part of the river itself. To Shorewood’s dismay, Milwaukee would remember this nifty piece of historical trivia and turn it against the village four years later. 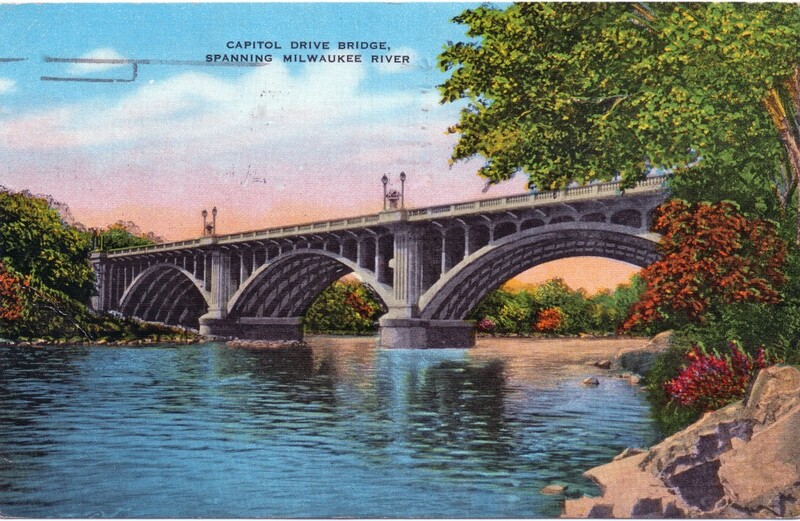 And that’s why I love this postcard of Capitol Drive bridge. Back to my original question: Why were postcard buyers attracted to views of bridges? We usually think of bridges, if we think of them at all, as utilitarian ways to get from here to there. In 1927 people would have seen things differently. The new Capitol Drive really was a marvel, not because it cost a jaw-dropping $400,000 in pre-depression dollars, not because it took 20,000 tons of cement to build, but because it connected the entire north side of Milwaukee with the entire North Shore by way of an impressively long, wide, and rather elegant piece of engineering. They were seeing the big picture. Carl, we are really enjoying learning about riverwest through your blog. Thank you for sharing your knowledge with us! Thanks – and there is a lot of history still to be told!